surface level the IC-7300 appears to be a standard HF transceiver, however it’s whats under the hood that makes the IC-7300 very different. For you that like numbers, here is Rob Sherwood’s test results. The receiver test results are excellent for a radio in this price category. The IC-7300 appears to be using a 14 bit chip for processing instead of a 16 bit chip to keep costs down. However, the performance difference between of a 16bit processor and a 14 bit processor is not that large. The IC-7300 can display a maximum of 1MHz of bandwidth on the internal lcd screen. This is more than enough for covering most ham bands. The scope can be zoomed in for closer views by changing the Span settings. After using the IC-7300 for a couple of weeks it’s good, very good. Since there is a lot of depth to IC-7300 and this article could go on forever, lets just hit the high points from the end user perspective. The IC-7300’s bid quality is excellent. Nice compact size with a very sturdy feel to the radio. The buttons and knobs have a nice feel to them. Nothing wobbles or wiggles. The VFO knob has a great feel to it and is just the right size to it. The VFO knob also includes a drag and lock adjustment so you can tweak it to your liking. The IC-7300 is a very solid feeling radio. The back panel is relatively uncluttered and features a large muffin fan for cooling on transmit. The back panel has connections for power supply, ground, antenna, acc connector, type B usb port, CIV remote jack, key, send control jack, ALC input jack, and a tuner control jack. The from panel has a microphone input and a headphone jack. The built in LCD touch screen is also excellent. Very sharp, bright, and also very responsive to touch input. Overall and excellent put together transceiver. The IC-7300 by using a combination 25 buttons, 4 knobs (technically 6 knobs since the twin pass band knob and the AF / RF/SQ includes a second concentric knob), and the touchscreen makes the IC-7300 a dream to use. No more hunting through a forest of buttons to do something simple. Many features or settings can accessed quickly via the touch screen or the Multi knob. Thus allowing the operator to change settings on the fly very quickly. Icom did a great job of making commonly needed features and adjustments available in an intuitive manner without a lot of clutter and confusion. Ok, the realtime spectrum / waterfall is one of the big features of the Icom-7300. 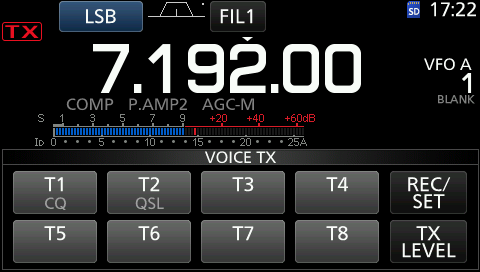 Icom has done a great job with this aspect of the 7300. The scope is very bright and clear with good color saturation. Off angle viewing is excellent. The resolution of the display is very good, making it very difficult to see any pixels even if you are very close to the screen. You will have to be about 4 inches from the screen to just begin to barely see some pixelation. Unlike most spectrum displays on higher cost transceivers the Icom runs at around 30 fps. There is no delay that is apparent on the scopes of most of the higher end legacy transceivers. The Icom-7300’s scope is smooth and fast. The scope can be turned off if you want to have a larger frequency display and metering display. When the scope is turned on the size of the frequency display and meter display is reduced to make more room for the scope.Touching the meter display lets you quickly switch between the metering type. The two touch types that Icom uses on the LCD is a “short touch” or “long touch”. You may want to try out the “long touches” on the LCD screen buttons, there is a good chance there may be another setting hiding there. You will get the hang of getting around quickly its all pretty intuitive for the most part. Previous: Previous post: Elad FDM-DUO – SDR Done Right! I own a Icom IC7300 and it is a very nice radio for the price. However, i think it is only half of what I would consider a SDR without the ability to leverage other than OEM SDR software. An I/Q output in the current USB needs to be a top priority for either the next or following firmware. Otherwise, this radio will be overcome by the next Japanese manufacturer that decides to incorporate such capability. Maybe Icom won’t care since they have sold so many units as a first mover in the space, but I certainly hope that they add this capability to this rig. There are certainly many reasons why they will hold back (primarily because they will want people to purchase their next higher cost unit that will have more open architecture and capability) but I hope they don’t. This rig is super nice but it is a bit of a shocker that this was not included as a capability. I did not buy the additional icom software because because of all the negative reviews and the YouTube videos I have seen demoing it make me really question the need to actually buy it. It appears to be very clunky and the panadapter inflexibility to scale to the computer screen and apparent latency compared to the ic-7300 touch screen panel are a huge turnoff for me. Yes it can be done, but not directly from the radio. The RSBA1 software adds that feature. The other technique is to remove the SD card and plug the card into a computer. Move the recording to the voice memory directory , plug the card back into the 7300. Assign the file to a voice memory button. Press the button on the voice memory on screen and the recorded audio will be transmitted. It’s a lot easier than it sounds. Just curious. I’ve been thinking of purchasing an IC-7300 to be used primarily as a replacement for my aging Icom R75 receiver. So aside from transceiver use, and instead using it as a communications receiver, how would you compare it’s receive capabilities in comparison to the R75? Would it be a worthy replacement? Or would I be better off purchasing a dedicated receiver? I have an IC-7300 and am very satisfied with the performance. It is easy to operate and does have too many unnesaccery unwanted bells and whistles. ICOM have issued 4 firmware updates which I have installed the last one rectifying problems with the USB port. ICOM are bringing out the IC-7610 which is also a SDR touchscreen but at twice the price which I think is a bit steep but as I say I am very happy with my 7300 and would recommend it. I’m an old style cw op. Wish the 7300 had a bug emulation mode. Refering to Third party software, please confirm that the 7300 will handle NBEMS digital applications such as FLdigi, FLmsg, etc. In addition the recent addition of FSQcall that is gaining in popularity. This is a really nice radio, it initially sold well, and ignoring the internal SDR architecture, it’s main competition is the Yaesu FT-991A which adds 2 meter and 70cm transmit and VHF/UHF receiver coverage. Without having a true I/Q output, or coverage above 70Mhz, the 7300 is largely more comparable to the FT-991A than most any wideband SDR. 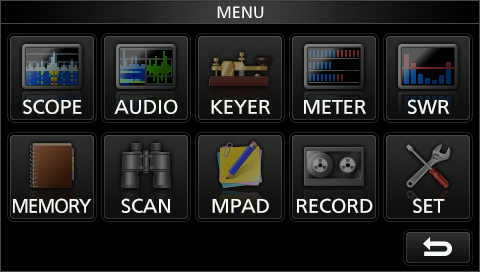 The Yaesu also comes with more options included and you don’t have to spend $100 on the software. The 7300 has an edge in dynamic range on a test bench but real world performance seems to be very similar to the FT-991A. The “A” revision of the 991 fixed the two major problems–finals failing and a realtime waterfall making it a much stronger competitor to the 7300. In short, I think Icom either needs to add I/Q or risk Yaesu or Kenwood beating them to it leaving Icom in the dust. 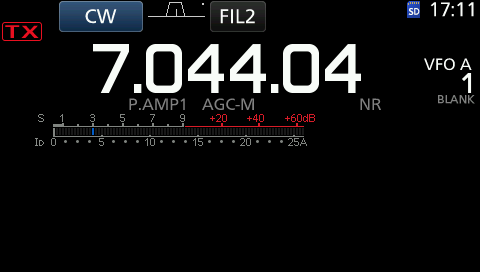 Right now the FT-991A appeals to many more buyers than the 7300 primarily because of the VHF and UHF support. So Icom is already behind in some ways and the far more expensive IC-7610 does nothing to correct any of the above issues. What are the pluses to the Icom IC-7300 to a medium wave / short wave listener ? I would say the first on the list is it being a “Direct Sampling” Software Defined Receiver design. That’s right….no traditional mixer and IF stages. Right from the antenna input there are 15 bandpass filters then to a 14 bit analog to digital converter, after that there is a FPGA (Field Programmable Gate Array). Use of a TI TMS320C6745 DSP after that which makes sense being this is standalone SDR device.